The convention started last year with a bang pulling in 1200 attendees. Keep in mind, we only expected 400. This year the convention went above and beyond with talents like Unwoman and Tracy Hickman. It was great hearing the various steampunk bands play in the main events, while attendees with adventurers passes completed quests in the halls. It was also fun to make said adventurers sing and dance for the quest items. They got extra points for singing the coconut song. I wish I had a chance to see the Nerf Battle this year, but I hear it was a hoot. Advice for those looking to try it next year: Don't mess with the referees, they can give kill shots. Don't get "caught" cheating. You will be shot by the audience. Also, the guy with swords, yes he is a ref and you do not go near him. Those are what I heard from adventurers and the volunteers assigned to work on that event. Check it out! I am in 3d! 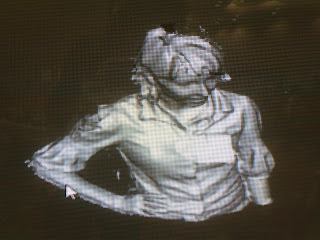 there was a group doing 3d models of people with a Kinect! You could then, for the right price, order a 3d print of yourself for tabletop games! How sweet is that! This is probably the only picture of me in my somewhat steampunk. I look forward to attending Steamfest next year as a regular attendee. I am backing down on the volunteer leadership role so I can focus more time on actively achieving my dreams. I might even join the adventurers on their passes with the fun Nerf battles and daily quests.